UA Rotary is proud to touch the lives of those who live in Upper Arlington, as well as throughout the City of Columbus and around the world. We have rallied our time, energy and dollars to support such important programs as West Broad Elementary School, the Homeless Families Foundation, UA High School Interact Club, Mayan Families In Guatemala and many others. Working with the Mayan Families organization in Guatemala we have financed and provided oversight for a number of sustainable projects for the benefit of one of the poorest areas in the world including establishing a preschool and middle school, a trade school and a number of water projects, while also providing two fire engines for local use. We have provided funding and volunteers for Special Olympics Ohio, including the State summer games and the fall district swim meet. We provide and serve meals to the homeless at this facility multiple times a year and have also funded a number of projects there as well. We have a long standing relationship with this school providing readers, tutors and mentors to work with students, many of whom are in challenged environments. We also sponsor a number of excursions including an annual visit by third graders to the Nutcracker. We have sponsored a vibrant and active Interact Club at both the high school and middle school levels in Upper Arlington. This is a club for teens interested in performing service projects. These young people partner with Rotarians in almost every service project we undertake. Learn more about Interact. We are engaged every year in service projects with and for the city of Upper Arlington. Past projects include providing a library story walk in one of the parks; a gazebo in one of the parks; and cleanup and recycling projects. In addition to the YWCA activities we have provided support to Second Chance Ministries and have provided meals and appliances for the Homeless Families Foundation. 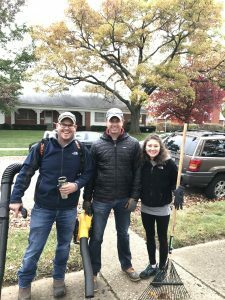 We have provided funding for a number of playground and classroom projects at Upper Arlington schools and have also been involved in helping to sponsor an interactive collaboration between an Upper Arlington elementary school and an inner city counterpart sharing exchanges and working on joint projects. We provide volunteers monthly for this initiative. We provide both funding and volunteers for Santa’s Silent Helpers and the Holiday Wish program which provide food and toys to those in need over the holidays. We also help to collect coats for the Community Shelter Board and provide bell ringers for Salvation Army’s kettles. We have provided both funding and volunteers for the Furniture Bank in central Ohio which provides free furniture to those in need. We provide a number of annual scholarships to area high school students in recognition of their community service and also periodically provide vocational scholarships for working adults. We also help to facilitate cultural student exchanges between Upper Arlington students and students abroad. Rotarians on a global basis have been dedicated to a long standing project to eradicate polio everywhere in the world. We are only a few countries away from realizing this objective. The Object of Rotary is to “encourage and foster the ideal of service as a basis of worthy enterprise.” Rotary is a service organization.” Since 1910, the Rotary Motto has been “Service Above Self.” Rotary strives to achieve it’s objective of “Service Above Self” through activities in five primary areas. These are often referred to as the “Five Avenues of Service”. This “Avenue” promotes the development of acquaintance as an opportunity for service, which helps make the club stronger. It involves the activities necessary to make the Club function successfully and achieve its goals. A thriving clues is anchored by strong relationships. This area represents the opportunity that each Rotarian has to represent the dignity and utility of one’s vocation as an opportunity to serve society. Rotarians promote and foster high ethical standards in business and professions and promote the recognition of the worthiness of all useful occupations. Vocational service call on every Rotarian to work with integrity and contribute their expertise to the problem and needs of society. This “Avenue” relates to the activities that Rotarians undertake to improve the quality of life in their community. Particular emphasis is given to helping children, needy families, the aged, the handicapped, and those most in need of assistance. Rotarians strive to promote the ideal of “Service Above Self” in their personal, business, and community lives. This area recognized the positive change implemented by youth and young adult through leadership development activities as RYLA, Rotaract and Interact, service projects, and creating international understanding with Rotary Youth Exchange.